I thought that we would start with the most elaborate of the games, Drink-A-Palooza! 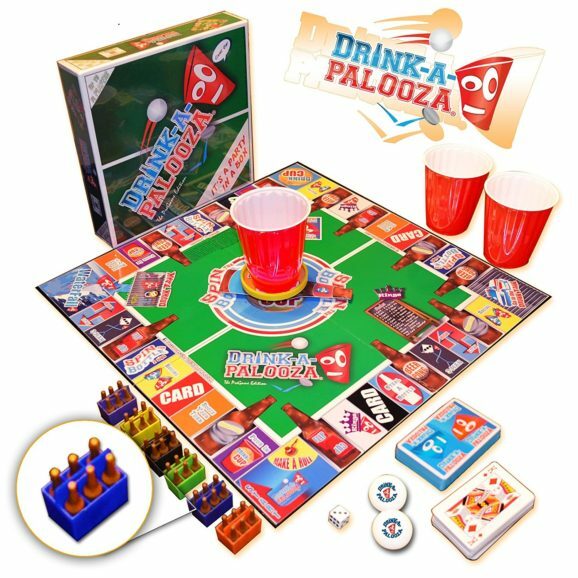 Unlike most of the other drinking games I have encountered, Drink-A-Palooza is an actual board game with a start and finish. This I thought was pretty cool. The idea of this game is that it mixes up many of the popular drinking games, you have things like beer pong, quarters, kings cup and flip cup. Games that are very simple when you start to play, but after a couple of beers or shots, you better have some Jedi kind of powers to still be good at them! The selection of games that you will have to play mean that there is surely going to be at least one game that everyone playing can be good at. It also keeps it exciting and moving along at a quick pace. Drink-A-Palooza is regularly voted as one of the best drinking games and after our first game, I could see why. I played with three other people, but the box says it can be played by up to 12 people! The idea of the game is that you have your own little beer crate and you need to fill it up with beers. You move around the board taking on challenges, drinking beers (or whatever) as you try to fill your beer crate up first. We had an absolute blast with this and when I heard that it was priced at around 30 bucks, I thought the asking price was actually very fair. The games do not last too long (well ours with four people did not) so you could bring this out at the start of a party to get everyone in the mood. Honestly, if you are looking for a drinking game that offers something a little bit more, Drink-A-Palooza would be perfect for you. May be hard for people to understand rules if they have been drinking before game starts! Ok, so I will raise my hand up and say that I am a wimp when it comes to shots. 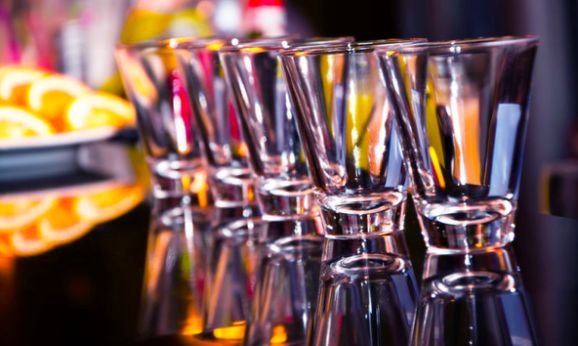 Even in my college days, I was a lightweight when it came to shots and now….. I am a little older I am even worse. Still, that did not stop me being very excited to give this EZ Drinker Shot Spinning Roulette Game Set a try with a couple of my buddies. I have played similar kind of drinking games before and with this one here, we let my friend Michael be the bartender as he knows how to make some tasty, but deadly shots. Apart from the booze, you get everything that you need here, which considering this can come in at under ten bucks is pretty darn amazing if you ask me. This is one of the best drinking games and it is also one of the classics. 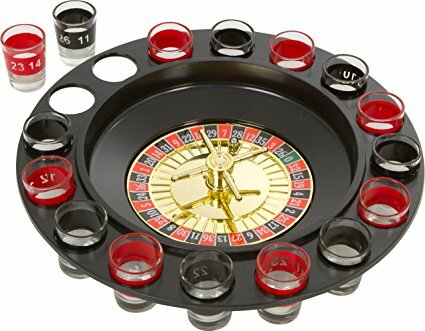 Included with this game is your drinking roulette wheel, 16 shot glasses with numbers on them, the fact they are numbered comes in very handy when you are a little tipsy. You also get two balls to use on the roulette wheel. The idea is very simple you fill all of the shot glasses and then take turns playing roulette. If you land on a number that has a shot in it, you must drink it. It is a very simple, but also very fun game to play and one thing that is easy to do is add your own rules to it. For example, we made it so if you landed on a shot, you would flip a coin to see if you would take the shot or if you could pass it to another player. My only criticism and this is not really with this version of the game but shot roulette in general. Is that when most of the shots have gone the game can slow down. But if you have a buddy like my Michael, then do not worry as he will just keep filling up the glasses! Look I will be honest and wondered just how good a card drinking game could be, but I and my “company” had a lot of fun playing Loaded Kings. By the way, let me just add that we did not play all these games in one night, my poor liver could not have handled it. Anyway, back to Loaded Kings. This is the nation’s most popular drinking game, well that is what it says on the packaging. 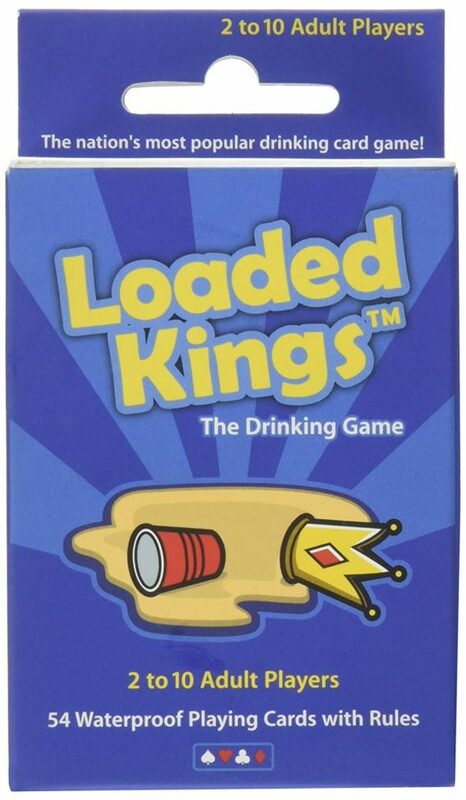 The first thing that you notice about Loaded Kings is that the cards are made for drinking! The folks behind this game know how clumsy most of us get after a few beers so the cards are booze proof….. that is awesome! The idea of the game is actually pretty similar to Kings Cup so if you have played that you will be right at home here and if you have not played it do not worry. Kings cup is usually played with a standard, boring and not a beer friendly deck of cards. But Loaded Kings is regarded as one of the best drinking games because it makes everything so easy. When you have had a few beers, the last thing you want to have to do is remember rules! Loaded King’s cards do not just have numbers on them, each card tells you what the rules are for it. Four is girls, six is for the guys, three is me and two is you and so on. Each card has a fun thing that you have to do which will ultimately make you tipsier than you were before. As far as I know there is no set number of people that can actually play this game. My group of four had a great time with it. Also, the fact it can be easily packaged away and have any beer spilled on them wiped off is great. For around ten bucks this is a fantastic deal. I just wanted to share a few thoughts about things to consider before you use some of your beer money on a drinking game. How Many People Can Play: Some drinking games can be played by a ton of people, but some others are designed for a much smaller group of people. There is no point in throwing a party for say, ten or more people and the game you buying only being for four players. What Do You Need? Now, of course, a drinking game is not going to actually come with any alcohol. It would be awesome if it did, but it would also raise the price a ton as well. Make sure you know what kind of booze is best for the game you are getting and if you need anything else to get the most of it. Read Reviews: Just like these ones here! Read reviews from people who have actually played the game so you can get a small idea if the game is fun and if it is good value for money. So What Is The Best Drinking Game? Well, my group of buddies had a great time with all three of these so picking just one is really hard. We had an absolute blast with Drink-A-Palooza, but that is the most expensive of the bunch and it does require that you pay attention to some rules, still, it was an awesome time and a game that I have used many times after. The EZ Drinker Shot Spinning Roulette Game Set was a lot of fun and getting 16 shot glasses for that price was really cool. Some have said the actual wheel is flimsy, but it was ok for us. Still, I could see how if you have some heavy handed friends it could break pretty easily. Lastly, we have Loaded Kings which at around ten bucks is great value for money and a ton of fun. Plus the fact the cards are pretty much drink proof is something everyone will think is cool. I say go for all three games! But in all seriousness, if I had to say what is the best drinking game out of these three it would be Loaded Kings!